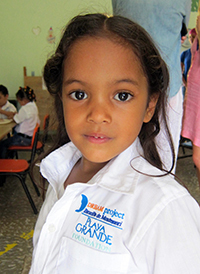 For the past five years, PGF has sponsored a free Montessori pre-kindergarten program serving more than 35 children annually within the local public primary school in Abreu (5 km from the Beach Club). This program helps to provide local children with an equal opportunity to learn and realize their full potential through transformative educational programs that combat the effects of poverty. This is the only free pre-kindergarten program in our area and the only pre-kindergarten program in Abreu. Every February Rio San Juan hosts Carnavarengue (where Carnaval meets merengue). The country’s only marine-themed Carnaval has tremendous potential to bolster tourism in the area while deepening and celebrating cultural traditions. As the primary sponsor of Carnaval, The Playa Grande Foundation takes great pride in supporting the poster, mask, and bands of revelers contests, which give rise to brilliant works of local folk art. Many of the masks can be seen around the Beach Club. With a depressed economy and an ever-shifting cultural landscape, this is a unique opportunity to partner with Rio San Juan in promoting sustainable, locally driven tourism that highlights and archives the beauty and craftsmanship of the Dominican Republic. Each Spring, non-profit medical teams come to Rio San Juan to perform free surgeries in the local community. These include eye, gall bladder, skin, bladder, ovarian, and other minor surgeries. They also perform routine primary health care evaluations, gynecological examinations, well-child appointments, and diabetes clinics. They serve over 1,500 local residents in their two-week operation. The Playa Grande Foundation provides all costs related to running their generators in order to ensure constancy of electric service. We also provide meals and lodging for the visiting resident doctors and local volunteers.